The Skeleton Queen is the Queen for the Skeleton's side in the 852001 Castle Chess Set. 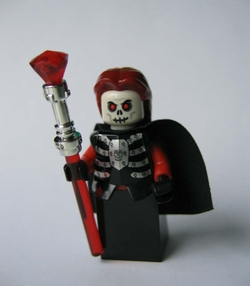 She has a black cape, a usual Skeleton Warrior skull, and long dark red hair. She wears Skeleton Armor, with her legs being a sloped brick. She carries a staff which consists of a Transperant red bar, a shiny Lightsaber hilt, and a Red Jewel for the top of the staff.